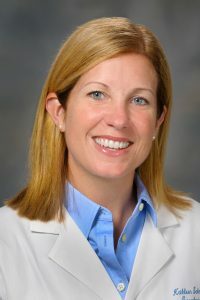 Dr. Kathleen Schmeler is an Associate Professor of Gynecologic Oncology at The University of Texas MD Anderson Cancer Center. She graduated from Clarkson University with a degree in Mechanical Engineering and then went on to receive her medical degree with The Medical College of Pennsylvania/Hahnemann University School of Medicine. She completed a residency in obstetrics and gynecology at Women & Infants’ Hospital/Brown University followed by a fellowship in gynecologic oncology at MD Anderson Cancer Center. Dr. Schmeler’s primary clinical and research interests are focused on cervical cancer prevention and treatment, particularly in low and middle-income countries (LMICs), as well as for medically underserved women in the United States. She is performing several clinical trials in Latin America and around the world, focused on developing better ways to prevent and treat cervical cancer in low-resource settings. Dr. Schmeler is especially dedicated to training and education. She runs the MD Anderson Cervical Cancer Project ECHO (Extension for Community Healthcare Outcomes) program, a tele-mentoring program which uses videoconferencing to link faculty at academic centers with providers in medically underserved areas. Through ECHO, Dr. Schmeler and colleagues are teaching colposcopy and supporting providers practicing in the Rio Grande Valley, an area along the Texas-Mexico border where cervical cancer rates are 30% higher and where there are 40% fewer physicians and half as many nurse practitioners as the rest of Texas. Dr. Schmeler and colleagues also run ECHO programs for invasive cervical cancer focused on training and supporting gynecologic oncologists as well as medical and radiation oncologists in Latin America, Mozambique and Zambia. ECHO is part of a larger strategy and Dr. Schmeler and colleagues spend a lot of time in other countries performing hands-on training as well as working with Ministries of Health to strengthen their cancer prevention and treatment policies and services. Given her experience and accomplishments, Dr. Schmeler was recently selected to be the Chair of the IGCS Education Committee.